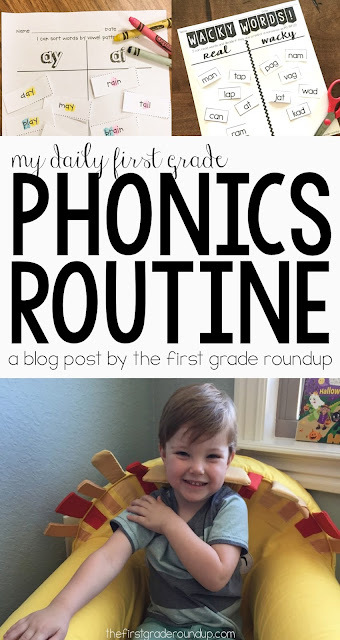 It took me almost 10 years to find my groove with phonics in my classroom. If I'm being honest, I spent the first 9 years of my teaching career hating phonics and making excuses to just not teach phonics or spelling in my classroom...or so I thought! Mostly, I hated scripted phonics lessons. I hated reading thick teacher guides...so I thought I hated phonics altogether. 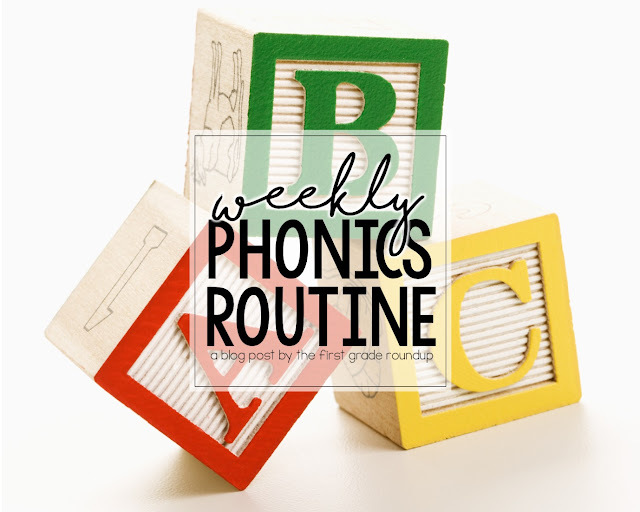 I spend about 15-20 minutes on direct phonics instruction each day. Of course, my kids get more work on phonics in guided reading and word work during stations...but this is our whole group phonics block time! Here's a look at what we do each day....but if you are more visual, watch the video to see my routines here. First, we read through our phonics chart (2 minutes) ...either the alphabet chart, blends chart, or vowel chunks depending on our focus sound for the week. Then, I introduce our new sound (3 minutes). Let's say our new sound is long e as in ee or ea. 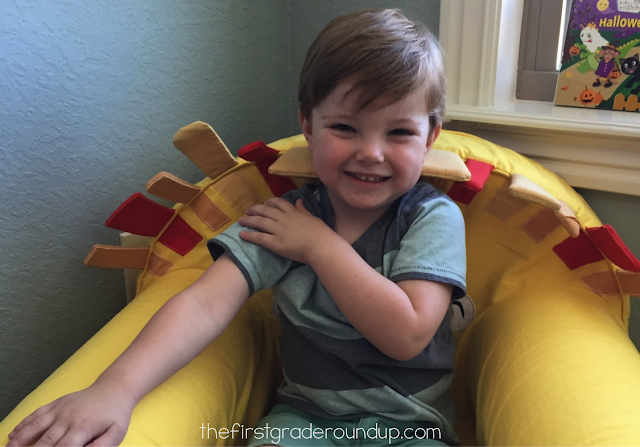 I show my kids pictures of our long e pictures and we say the word together. My kids listen to see if the word has our focus sound. They give me a thumbs up or down to let me know if the word has our focus sound. If the word has our focus sound, we then listen for the position of the sound. Is it at the beginning the middle or the end? My kids touch their arms to show me the position of the word (see my video on this). Next, we look at words that have our focus sound and sort them (2 minutes). For our example focus sounds, ee and ea, I would sort the words into an ee and ea category. At this point, we are really just focusing on looking for the focus sound and not necessarily reading it fluently yet. I will read the word and then have them tell me where to sort it. We sort it whole group. Then, I can add the same sort into their word work station to do independently or with partners later. Find the whole year's sorts here. After our sort, we decode our words--slippety slide style (3 minutes). We have 3 words that decode each day of the week (except Fridays). You can watch me model slide, slide, slippety slide in this video. We do this for each word. We slide the first word together. Then, I ask, "what long e pattern do you see in this word?" and call on a random student to answer. Then, I ask that same student, "and where is the sound in the word?" and they answer beginning, middle or end. Finally, we highlight the pattern in the word together. We repeat this routine for each word. This can be done whole group on the interactive powerpoint, or can be done as guided practice with each student having their own word list. Then, we work on spelling with our break it down chant (3 minutes). If you've seen my spelling video, you already know this routine. It's available to view here, so I won't rehash in this post! 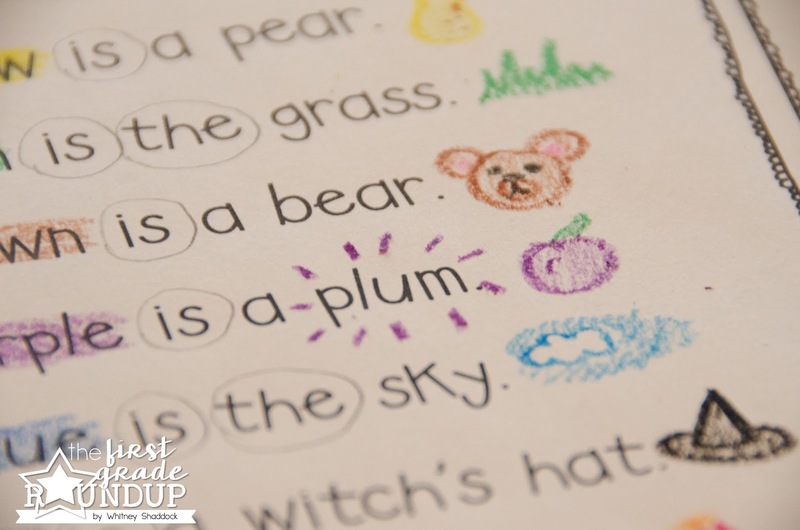 As soon as we finish decoding our word list, I tell my kids to get their dry erase boards ready and while we are transitioning, they practice writing our sight words on their boards or spelling words we've already learned for the week. Once everyone has their boards ready, I introduce 2 new words on Monday with our dry erase boards and our break it down chant. 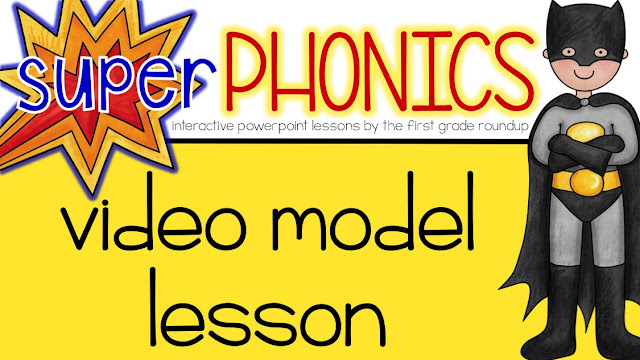 Finally, we introduce new sight words (5 minutes). I love using Body Spell from Go Noodle for this! 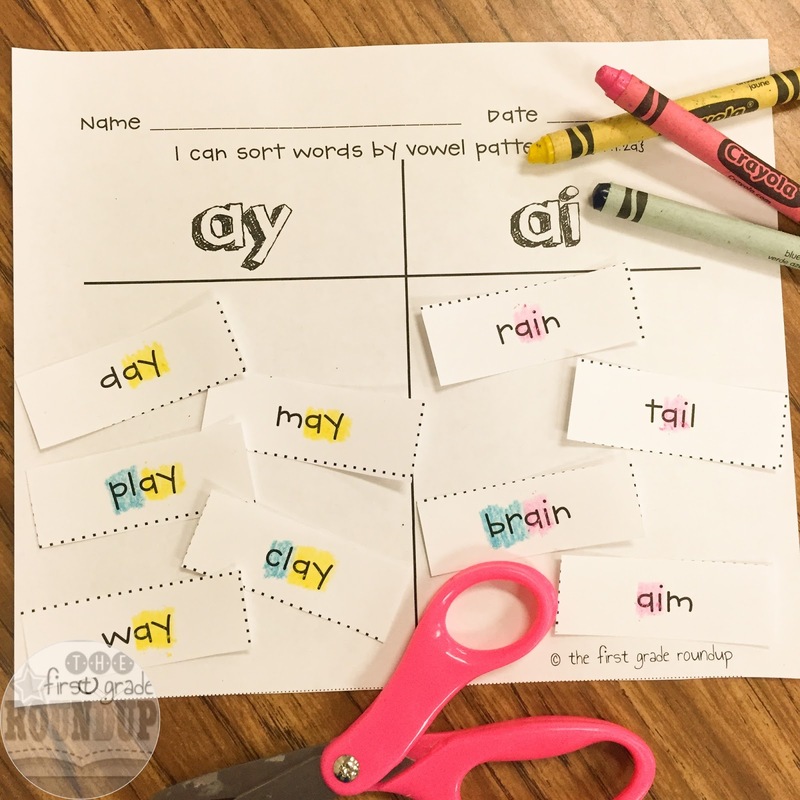 It's perfect: I just type in our new sight words for the week (I have a suggested list of sight words in my phonics powerpoint pack) and the kids get to practice reading and spelling our sight words and have a brain break too! I love it! Tuesdays, Wednesdays, and Thursdays look very similar to Mondays with minor changes. Here's a look at Tuesday! Then, I introduce our phonics poem (5 minutes). I read it to them without showing them the poem. Then, I reread the poem and students listen for our focus sound and I have them give me some TPR (total physical response) when they hear it. For our example ee/ea sounds, when my kids hear that long e sound, they smile really big and put their fingers in their cheeks because I teach long e as the sound that makes us smile! :) Next, I show them the poem and they look for our focus pattern with their eyes. We highlight the focus sound words together. Next, we decode our words--slippety slide style (3 minutes). We decode 3 new words from our word list for Tuesday. Then, we work on spelling with our break it down chant (3 minutes). During our transition to dry erase boards, students write our spelling words we introduced yesterday. Then, I introduce two new spelling words with the same routine as Monday. Finally, we do a sight word hunt (5 minutes). We go back to our poem and reread it together looking for sight words. I have kids come up to our interactive powerpoint and circle the sight words they see in our poem (new ones from this week and old ones). Then, we sort real and wacky words (3 minutes). 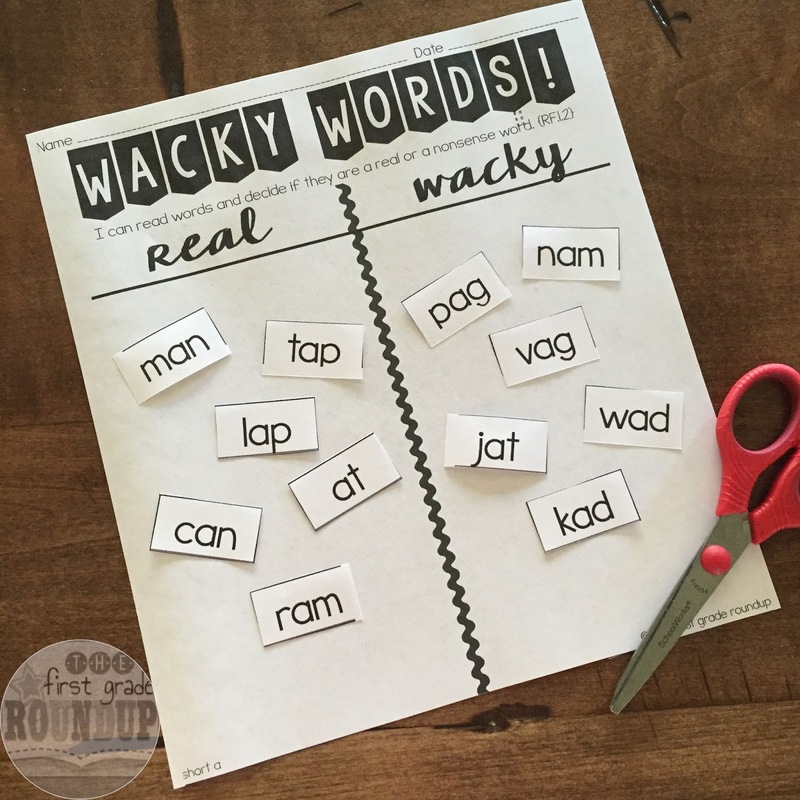 You can read about why I now LOVE using nonsense words in phonics instruction here! We decode each word together and decide if its real or wacky. If it's real, my kiddos open their hands in the shape of an open book--it's a real word we can find in a book. If it's fake, they do the crazy sign around their ears! :) Just wait for all the giggles!! This is another activity that gets added to my word work station for partner or independent practice later on! Next, we decode our words--slippety slide style (3 minutes). We decode 3 new words from our word list for Wednesday. Finally, we leave our dry erase boards out and play sight word I spy (5 minutes). We do this whole group. I say, "I spy a sight word with 4 letters." The kids write a word with 4 letters. If anyone gets it right after the first clue, they win a ticket (our school wide character reward system). If no one has it, I give another clue...like: "I spy a sight word with 4 letters that has a 'c' in it." We continue until I have at least one winner. We play for about 5 minutes. Once we've modeled this game several times together, we play it with partners later in the year. Next, we decode our words--slippety slide style (3 minutes). We decode 3 new words from our word list for Thursday. Then, we review our six spelling words from Monday-Wednesday on dry erase boards (10 minutes). We do a practice spelling test whole group on their dry erase boards. This is another activity that we do whole group at the beginning of the year and as they learn the routine, they do a partner practice test with dry erase boards later on. Finally, we practice our sight words in sentences. Sometimes I show the sight word and have students use it in a sentence for me or turn and tell their partner a sentence for the sight word. And some weeks, I have sentence frames already with fill in the blanks to decide which sight word goes in which sentence. These are on my interactive powerpoints for each week. Just know that some weeks I switch it up and have them give me their own sentence for the word instead. Everybody knows Fridays are crazy. Teachers are ready for the weekend. Kids are ready for the weekend. And it's pretty much assembly day where I'm at too! So, the best thing I did to help me be more successful and consistent with my phonics block was to do a phonics test on Friday at the beginning of the day and be done! :) ...well, almost! On Friday mornings, I have my kids come in and get our phonics poem for the week, at it to their poetry folder, and highlight our focus sound words and circle sight words like we did together on Tuesday. 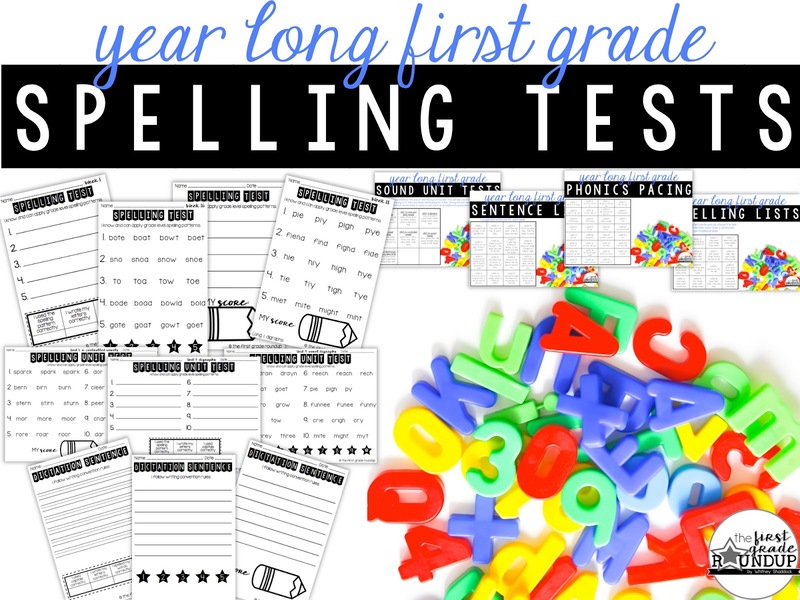 You can read about my phonics tests and how I assess in this post. 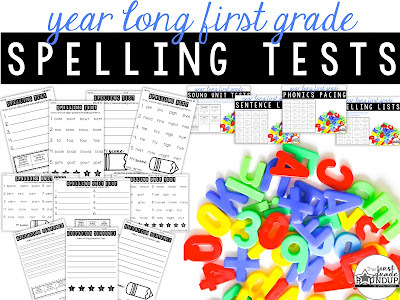 And find my pre-made year worth of spelling tests that align with my phonics program in this packet. 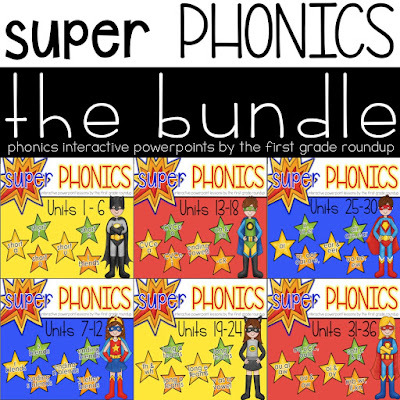 And if you are interested in using my interactive phonics powerpoints, you can find the bundle and in my store!